Watch the ArcGIS for AutoCAD Build 350 Overview. Connect to ArcGIS for Server feature services and edit the features using AutoCAD tools. Edit disconnected feature services. You have the ability to edit geodatabase features while connected to the network or out in the field, and then synchronise updates when ready (also known as a long transaction). Edit attributes of a feature service wherein the published domain constraints of coded value domains and range values are honoured. Extract your own local copy of geodatabase features from a feature service as CAD entities with their feature class attributes. Navigate your drawings by street address or place names using Esri's online world locator service. View and query multiple georeferenced ArcGIS maps in AutoCAD without data conversion. Use maps that are automatically positioned and projected on-the-fly according to the coordinate system defined in the CAD drawing or the map service. Get access to all the attributes of the underlying features with the map identify tool. Choose automatic or on-demand display updates of maps and imagery when the AutoCAD view is changed. Organise the draw order and transparency of map and image services. Toggle the visibility of individual map layers of any map service on or off. Share links with colleagues the online resources for map, image, and feature services from a drawing. Save geographically positioned snapshots of maps and imagery as static AutoCAD raster reference entities to work disconnected. Create and edit GIS data in standard .DWG files that ArcGIS for Desktop also reads and writes. Add GIS attributes to any AutoCAD entities. 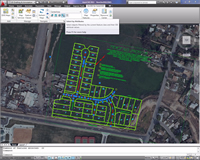 Select drawing features by their GIS attribute values. Add Esri industry standard data models into your CAD workflows. Filter graphic selections by feature class membership. Select from thousands of Esri coordinate system definition files (.PRJ). Customise your CAD mapping applications with specific ArcGIS for AutoCAD commands and AutoLISP functions that allow you to directly manipulate the GIS objects in ArcGIS for AutoCAD. Manage the tabular attributes of features within your drawing using the provided attribute table viewer and powerful attribute editing dialog box. Utilise the rich attributed feature class data inside an AutoCAD .dwg file, when data is exported from ArcGIS for Desktop using the EXPORT TO CAD geoprocessing tool. ArcGIS for AutoCAD identifies attribute information from GIS features to give you full context of the surrounding environment.